I was coming into the house from the driveway today and saw that our plumbago shrub was covered with blue-violet blooms. 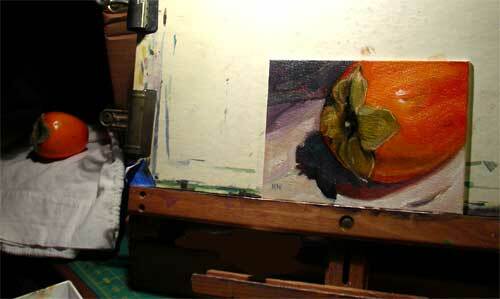 It immediately struck me that those colors would be a good compliment to the yellow-orange persimmon I painted last night, and which had survived the ordeal, no worse for wear. So I set up another still life in the same stage, this time a wider shot incorporating a bit of drapery. I don’t often draw folds, let alone paint them, so this was a good experiment for me, and I’m satisfied with the result. 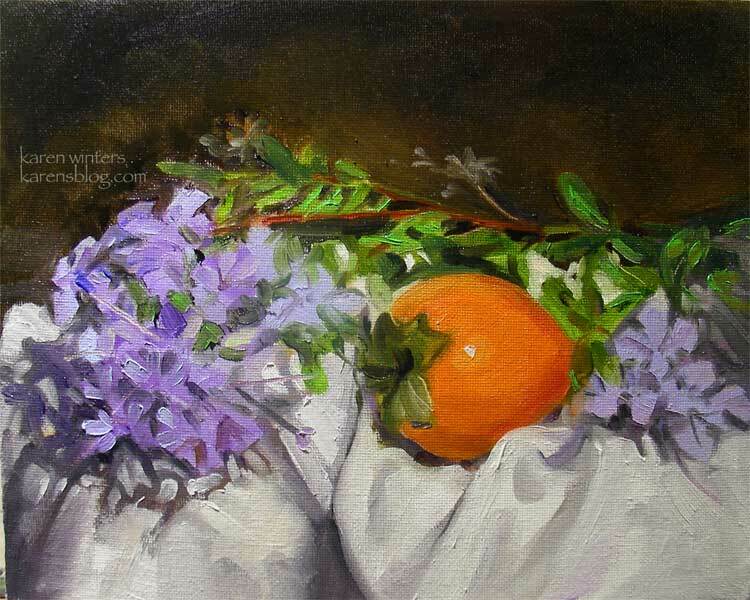 I used the same colors as yesterday for the persimmon, plus UM blue and some alizarin crimson for the plumbago. Painted from life and still soaking wet. That’s why you’ll see little shimmery dots in the photo of the room light bouncing off the paint. With Descanso and the Redlands show behind me, I’m busy again getting ready for the art walk in our neighboring town of Montrose. Painting still lives is a very relaxing discipline. They don’t move and under room light I don’t even have to worry about the sun disappearing behind the clouds. I like to paint them alla prima, wet into wet, all in one sitting. 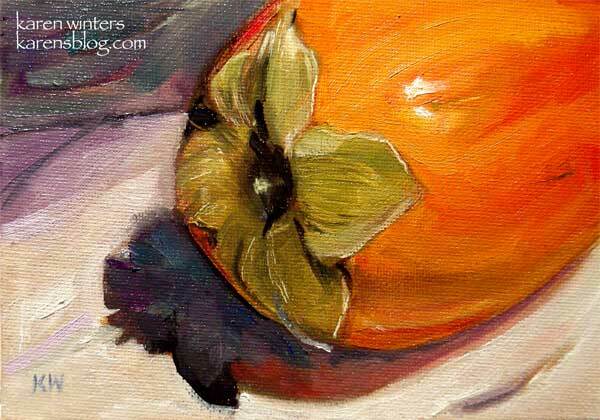 Our son tells us that persimmons are very delicious but I never eat them, I just paint them until they start to look old and then, unfortunately, they’re too old to eat also. Maybe next time I should get some to paint and some to munch. Just for fun I took a picture of my setup. The painting looks huge but it’s only because I’m close. It’s only 5 x 7 really. I have it in a cardboard box to eliminate exterior light so that the “key” light, coming from the upper right, is the only one that is consistent. 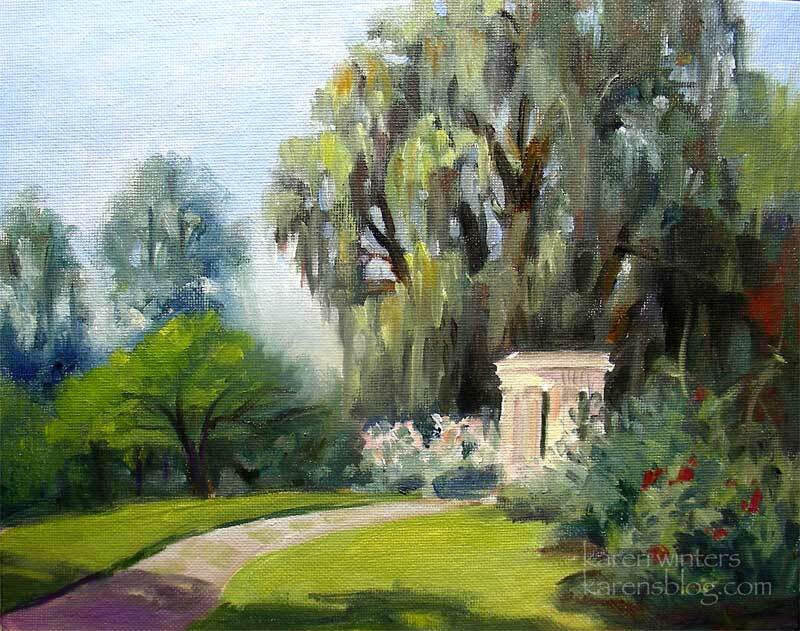 This was painted primarily with cadmium orange, cadmium red, sap green, a little ultramarine blue and white. 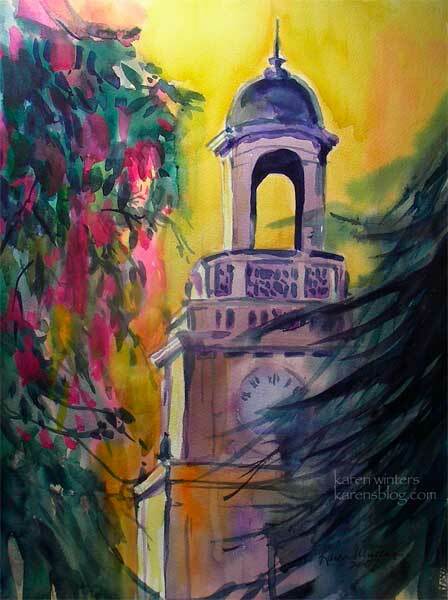 Here’s another of my University of Redlands series – the chapel clocktower at sunset, framed by a Chinese silk tree (I think) and a deodar fir tree. In the late afternoon the light made the facade of the tower just glow. I pushed the colors, of course, but that’s the fun of painting. This is one of the paintings I did last weekend en plein air at University of Redlands, about halfway between Los Angeles and Palm Springs. It was painted in the last 20 minutes of light of the day, when the colors are most intense and represents a view of the Administration Building from the viewpoint of the quad. Only a handful of painters were left at this time, but the colors were worth waiting for. Painting at that speed means giving up actual detail for suggestion of detail, which is different kind of challenge and one that I enjoy. 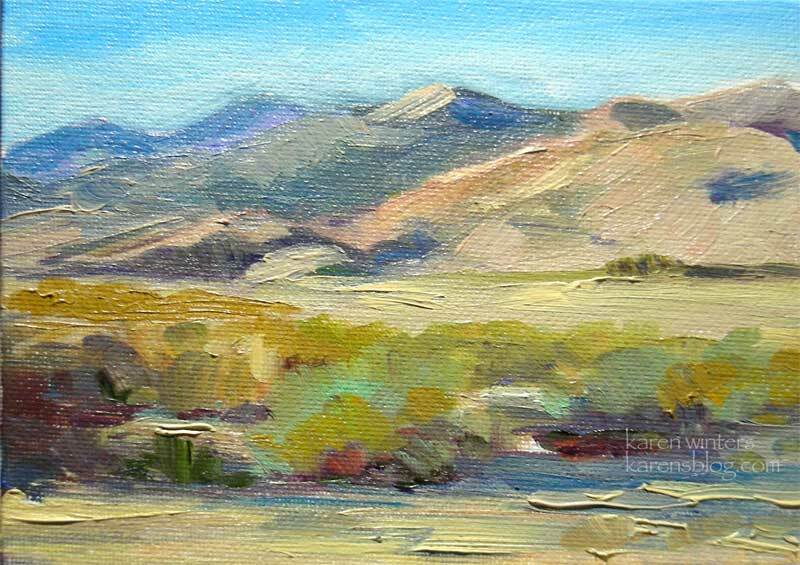 This is one of the pieces that will be in the U. Redlands show, along with two other plein air paintings and a big bunch of other regional and desert scenes, some of which have already been posted here. 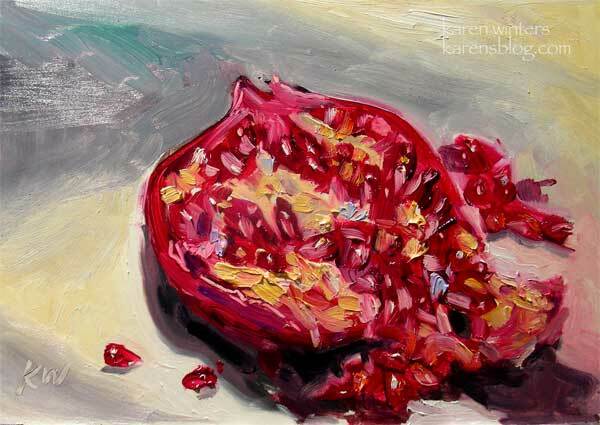 SOLD – but I have other Huntington paintings. 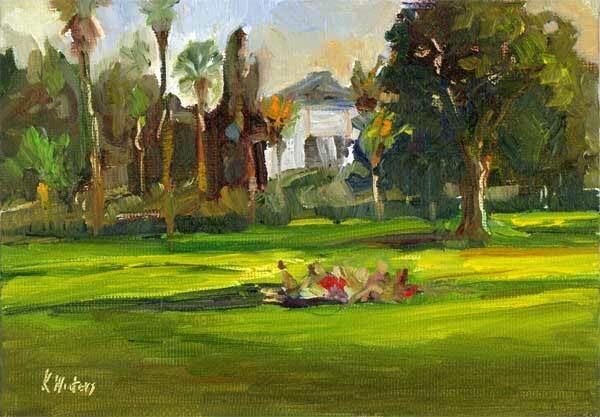 This little painting was painted plein air style at Huntington Gardens early one morning. The sun was climbing rapidly so I concentrated on painting the “temple of love” first, while the light bounced warmly inside the classical structure. Then, I worked on the foreground and background trees and finally the grass, which didn’t change appreciably. I don’t know the species of the large tree but it is not a weeping willow. I’d say it looks like it’s in the juniper family, and although I looked for a plant marker I didn’t find one. Maybe some horticultural expert who knows the Huntington plants can enlighten me? There is such a plant as a Tolleson’s weeping juniper, but it supposedly only grows to 30 feet and this one was much larger. Anyway, back to the plein air part. I’ve been using a glass palette these past few weeks and although I’m a little concerned about its fragility in the field, I really like the ability to clean it quickly with a glass scraper and have a fresh area to mix in. I use a Masterson’s box to transport my palette and to keep it airtight between painting sessions, so the paint does stay fairly moist. This new painting – of an Inland Empire desert scene – will be one that I’ll display at the Redlands Centennial Plein Air show and sale this Saturday at the University of Redlands. 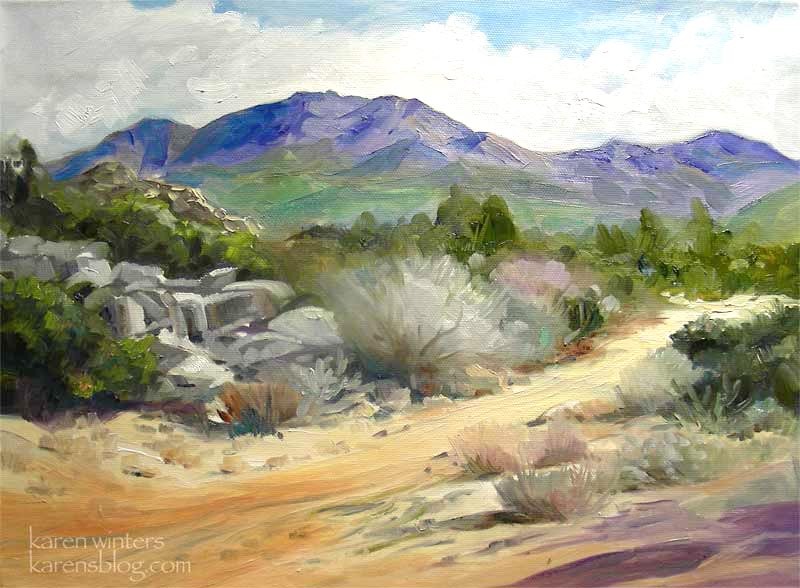 It depicts a typical byway on the road to Idyllwild – up highway 74 – in a little community called Pinyon Crest. If you live in that area you know just the kind of terrain I’m talking about. Very hot in the summer and very cold in the winter. The sale includes not only paintings of the University of Redlands and the city of Redlands but also scenes of the surrounding Inland Empire area – including San Bernardino and Riverside Counties. Last Saturday’s paintout was a great deal of fun. I got three paintings done that day – two 8 x 10 sized ones of campus buildings, and one small 5 x 7 painting, done feverishly at sunset – showing a long view of the quad with students lounging on the grass. Surprisingly, it was not windy on Saturday and the weather was in the low 80s, quite mild. There’s another paintout tomorrow but I don’t think I’ll be going – too much wind on the freeways bouncing around big 18 wheelers. 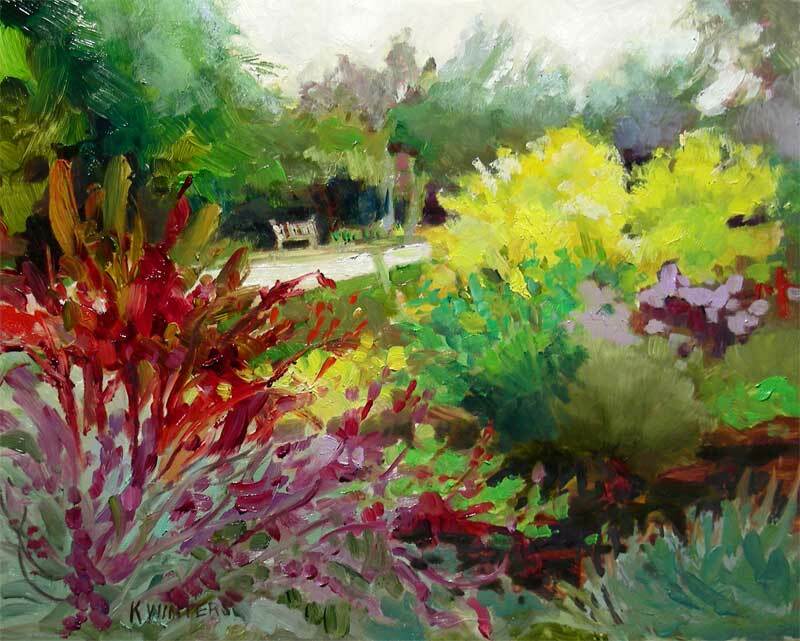 A little plein air painting at Huntington Gardens – in a fall mood. In the foreground: mexican bush sage, backed up by red amaranthus. The green clump was another sage but I don’t know the name of the plant with the yellow foliage. I’ll try to ID it on my next trip. The day was gray and overcast but it made the colors “pop” in comparison. Tonight I had the great delight of watching watercolorist Fealing Lin paint a demo. Last month I saw her paint a landscape – this month, at a different art group meeting, she did a fantastic loose portrait. Seeing her use of color and wet-into-wet techniques was inspiring and made me want to reach for my palette. My thanks to those of you who have sent such thoughtful emails recently – either asking questions about my painting practice or what it’s like to be a full-time painter juggling family responsibilities: your questions have given me the opportunity to reflect on what I’m doing, and your supportive thoughts are appreciated more than you know. This very small painting was done quite quickly a few days ago as an exercise in establishing a scene economically with the use of color, value and shape. 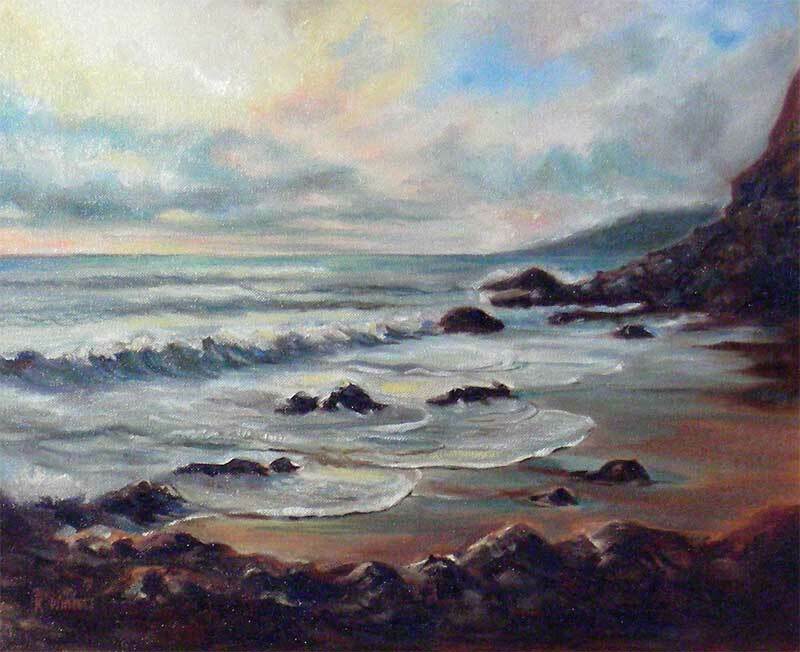 This is another seascape which was painted for the Descanso show. I heard some pretty good quotes about art over the weekend. Frank Webb is quite the storyteller and I’ve observed that people who demonstrate watercolor have a repertoire of good stories and quotes to share while they’re waiting for washes to dry. I haven’t seen that many oil painters demonstrate but so far I haven’t noticed as much raconteurship. Andrew Loomis: Every piece of the painting should look like it’s been painted. Maurice Grosser on “painting in public.”: A painting becomes a work of art when it gets sold and can have a life of its own other than your studio.